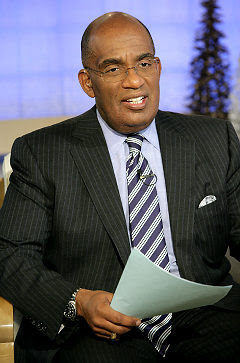 Al Roker will be in Charlotte Friday morning broadcasting his segments of the Today Show. Roker is on his "Lend a Hand" charity road tour, which kicked off yesterday in L.A. He's visiting a different city each day this week and bringing with him a truckload of donated items. The Charlotte recipient of those donated goods will be the Community School of the Arts, which teaches arts programs to children, including many from low-income households. The school is housed at Spirit Square in Uptown and that's where Roker will be broadcasting. Roker is America's favorite weatherman and it's great to see that a Charlotte organization has been chosen to receive this charitable donation and the nationwide attention it will bring. He's such a cool guy, known for his jolly good nature. But don't get on his bad side or he'll get gangster with you like he did with Speidi last week. If you watch the Today Show like I do then you know Roker checks in each half hour, usually on the sevens (:07, :37). The morning news show comes on at 7 a.m. on NBC (locally on WCNC) and you can expect the majority of the focus on the Community School of the Arts to air during the eight o'clock hour.